You must call power_statespace with a minimum of seven input arguments. You can also specify optional arguments. To use these optional arguments, the number of input arguments must be 12, 13, 14 or 16.
where x is the vector of state-space variables (inductor currents and capacitor voltages), u is the vector of voltage and current inputs, and y is the vector of voltage and current outputs. When you build a circuit from Simscape™ Electrical™ Specialized Power Systems blocks, power_statespace is automatically called by the power_analyze command. power_statespace is also available as a stand-alone command for expert users. This allows you to generate state-space models without using the Simscape Electrical Specialized Power Systems block modeling interface and to access options that are not available through the Simscape Electrical Specialized Power Systems library. For example, using power_statespace, you can model transformers and mutual inductances with more than three windings. The linear circuit can contain any combination of voltage and current sources, RLC branches, multiwinding transformers, mutually coupled inductances, and switches. The state variables are inductor currents and capacitor voltages. The state-space representation (matrices A,B,C,D, and vector x0) computed by power_statespace can then be used in a Simulink® system, via a State-Space block, to perform simulation of the electrical circuit (see Examples). Nonlinear elements (mechanical or power electronic switches, transformer saturation, machines, distributed parameter lines, etc.) can be connected to the linear circuit. These Simulink models are interfaced with the linear circuit through voltage outputs and current inputs of the state-space model. You can find the models of the nonlinear elements provided with Simscape Electrical software in the Specialized Power Systems library. rlc: Branch matrix specifying the network topology as well as the resistance R, inductance L, and capacitance C values. See format below. switches: Switch matrix. Specify an empty variable if no switches are used. See format below. source: Source matrix specifying the parameters of the electrical voltage and current sources. Specify an empty variable if no sources are used. See format below. line_dist: Distributed parameter line matrix. Specify an empty variable if no distributed lines are used. See format below. yout: Matrix of output, expressed as character vectors. See format below. y_type: Integer vector indicating output types (0 for voltage output, 1 for current output). unit: Character vector specifying the units to be used for R, L, and C values in the rlc matrix. If unit = 'OHM', R L C values are specified in ohms Ω at the fundamental frequency specified by freq_sys (default value is 60 Hz). If unit = 'OMU', R L C values are specified in ohms (Ω), millihenries (mH), and microfarads (µF). net_arg1, net_arg2, net_arg3: Used to pass arguments from power_analyze. Specify an empty variable  for each of these arguments. netsim_flag: Integer controlling the messages displayed during the execution of power_statespace. Default value is 0. If netsim_flag = 0, the version number, number of states, inputs, outputs, and modes are displayed. Output values are displayed in polar form for each source frequency. If netsim_flag = 1, only version number, number of states, inputs, and outputs are displayed. If netsim_flag = 2, no message is displayed during execution. fid_outfile: File identifier of the power_statespace output file containing parameter values, node numbers, steady-state outputs, and special messages. Default value is 0.
freq_sys: Fundamental frequency (Hz) considered for specification of XL and XC reactances if unit is set to 'OHM'. Default value is 60 Hz. ref_node: Reference node number used for ground of PI transmission lines. If −1 is specified, the user is prompted to specify a node number. vary_name: Matrix containing the symbolic variable names used in output, expressed as character vectors. These variables must be defined in your MATLAB® workspace. vary_val: Vector containing the values of the variable names specified in vary_name. A,B,C,D: state-space matrices of the linear circuit with all switches open. where nstates is the number of state variables, ninput is the number of inputs, and noutput is the number of outputs. x0: Column vector of initial values of state variables considering the open or closed status of switches. x0sw: Vector of initial values of switch currents. rlsw: Matrix (nswitch,2) containing the R and L values of series switch impedances in ohms (Ω) and henries (H). nswitch is the number of switches in the circuit. u,x,y: Matrices u(ninput,nfreq), x(nstates,nfreq), and y(noutput,nfreq) containing the steady-state complex values of inputs, states, and outputs. nfreq is the length of the freq vector. Each column corresponds to a different source frequency, as specified by the next argument, freq. freq: Column vector containing the source frequencies ordered by increasing frequency. Asw,Bsw,Csw,Dsw: State-space matrices of the circuit including the closed switches. Each closed switch with an internal inductance adds one extra state to the circuit. Hlin: Three-dimensional array (nfreq, noutput, ninput) of the nfreq complex transfer impedance matrices of the linear system corresponding to each frequency of the freq vector. Six columns: Implicit branch numbering. Branch numbers correspond to the RLC line numbers. Seven columns: Explicit branch numbering. Branch number Nobr is assigned by the user. Each line of the RLC matrix must be specified according to the following format. node1: First node number of the branch. The node number must be positive or zero. Decimal node numbers are allowed. node2: Second node number of the branch. The node number must be positive or zero. Decimal node numbers are allowed. If type is negative, the transmission line is modeled by a PI section of length |type|. See details below. N lines with type = 2 or type = 3; (one line per winding). Each line specifies R/L/U or R/Xl/Xc where [R/L, R/Xl = winding resistance and leakage reactance for a transformers or winding resistance and self reactance for mutually coupled windings. U is the nominal voltage of transformer winding (specify 0 if type = 3). One extra line with type = 1 for the magnetizing branch of a transformer (parallel Rm/Lm or Rm/Xm) or one line with type = 0 for a mutual impedance (series Rm/Lm or Rm/Xm). For a transformer magnetizing branch or a mutual impedance, the first node number is an internal node located behind the leakage reactance of the first winding. The second node number must be the same as the second node number of the first winding. To model a saturable transformer, you must use a nonlinear inductance instead of the linear inductance simulating the reactive losses. Set the Lm/Xm value to 0 (no linear inductance) and use the Saturable Transformer block, set with proper flux-current characteristics. This block can be found in the Fundamental Blocks/Elements library. It must be connected to the linear part of the system (State-Space block or S-function) between a voltage output (voltage across the magnetizing branch) and a current input (current source injected into the transformer internal node). See the Examples. If type is negative, its absolute value specifies the length (km) of a transmission line simulated by a PI section. For a transmission line, the R/L/C or R/Xl/Xc values must be specified in Ω/km, mH/km, and µF/km, or in Ω/km. Branch capacitive reactance (Ω at freq_sys). The negative sign of Xc is optional. Nominal voltage of transformer winding. The same units (volts or kV) must be used for each winding. For a mutual inductance (type=3), this value must be set to zero. Zero value for R, L or Xl, C or Xc in a series or parallel branch indicates that the corresponding element does not exist. The following restrictions apply for transformer winding R-L values. Null values are not allowed for secondary impedances if some transformer secondaries form loops (as in a three-phase delta connection). Specify a very low value for R or L or both (e.g., 1e-6 pu based on rated voltage and power) to simulate a quasi-ideal transformer. The resistive and inductive parts of the magnetizing branch can be set to infinite (no losses; specify Xm = Rm = inf). Five columns: All sources are generating the same frequency specified by freq_sys. Six columns: The frequency of each source is specified in column 6. Seven columns: The seventh column is used to specify the type of nonlinear element modeled by the current source. Voltage source: node1 is the positive terminal. Current source: Positive current flowing from node1 to node2 inside the source. type: Integer indicating the type of source: 0 for voltage source, 1 for current source. amp: Amplitude of the AC or DC voltage or current (V or A). phase: Phase of the AC voltage or current (degree). amp * sin(2π*freq*t + phase)for AC, amp for DC. model: Integer specifying the type of nonlinear element modeled by the current source (saturable inductance, thyristor, switch,...). Used by power_analyze only. The currents from all switches that have a null inductance (Lon = 0), if any. The currents from all nonlinear models that have a finite inductance (switches with Lon > 0, the magnetizing inductance in saturable transformers, etc. ), if any. All other voltage and current sources in any order, if any. Refer to the Example section below for an example illustrating proper ordering of sources for a system containing nonlinear elements. Switches are nonlinear elements simulating mechanical or electronic devices such as circuit breakers, diodes, or thyristors. Like other nonlinear elements, they are simulated by current sources driven by the voltage appearing across their terminals. Therefore, they cannot have a null impedance. They are simulated as ideal switches in series with a series R-L circuit. Various models of switches (circuit breaker, ideal switch, and power electronic devices) are available in the Simscape Electrical Specialized Power Systems library. They must be interconnected to the linear part of the system through appropriate voltage outputs and current inputs. The switch parameters must be specified in a line of the switches matrix in seven different columns, according to the following format. For these last two fields, you must use the same units as those specified for the RLC matrix. Either field can be set to 0, but not both. A linear part containing current sources and resistances that are connected at the line sending and receiving buses together with the linear circuit. A nonlinear part available in the Distributed Parameter Line block of the Elements library. This block performs the phase-to-mode transformations of voltage and currents and simulates the transmission delays for each mode. The distributed_param_line block must be connected to appropriate voltage outputs and current inputs of the linear part of the system. The line parameters have to be specified in the line_dist matrix and also in the Distributed Parameter Line block. Each row of the line_dist matrix is used to specify a distributed parameter transmission line. The number of columns of line_dist depends on the number of phases of the transmission line. For an nphase line, the first (4 + 3 * nphase + nphase^2) columns are used. For example, for a three-phase line, 22 columns are used. Ir_1, Ir_2,..., Ir_nphase for the receiving end. Vr_1, Vr_2,..., Vr_nphase for the receiving end. The desired outputs are specified by the matrix yout. Each line of the yout matrix must be an algebraic expression containing a linear combination of states and state derivatives, specified according to the following format. Current in branch n flowing from node1 to node2 (See format of RLC matrix). For a parallel RLC branch, I_bn corresponds to the total current IR + IL + IC. Current flowing into node x of a PI transmission line specified by line n of the RLC matrix. This current includes the series inductive branch current and the capacitive shunt current. If variable names are used (R1 and L2 in the above example), their names and values must be specified by the two input arguments vary_name and vary_val. Current at one end (node x) of a PI transmission line. If x = node1, the current is entering the line. If x = node2, the current is leaving the line. Voltage between nodes x1 and x2 = Ux1 − Ux2. Voltage of node x1 with respect to node x2. Refer to the Example section below for an example illustrating proper ordering of outputs for a system containing nonlinear elements. The following circuit consists of two sources (one voltage source and one current source), two series RLC branches (R1-L1 and C6), two parallel RLC branches (R5-C5 and L7-C7), one saturable transformer, and two switches (Sw1 and Sw2). Sw1 is initially closed whereas Sw2 is initially open. Three measurement outputs are specified (I1, V2, and V3). This circuit has seven nodes numbered 0, 1, 2, 2.1, 10, 11, and 12. Node 0 is used for the ground. Node 2.1 is the internal node of the transformer where the magnetization branch is connected. You can use the power_statespace command to find the state-space model of the linear part of the circuit. The nonlinear elements Sw1, Sw2, and Lsat must be modeled separately by means of current sources driven by the voltages appearing across their terminals. Therefore you must provide three additional current sources and three additional voltage outputs for interfacing the nonlinear elements to the linear circuit. You can find the state-space model of the circuit by entering the following commands in a MATLAB script file. The example is available in the power_circ2ss.m file. Notice that an output text file named power_circ2ss.net containing information on the system is requested in the call to power_statespace. % The measurements that you request follow, in any order. While power_statespace is executing, the following messages are displayed. y_u1 = 0.009999 Volts < 3.168 deg. y_u2 = 199.4 Volts < -1.148 deg. y_i3 = 0.9999 Amperes < 3.168 deg. y_i4 = 0 Amperes < 0 deg. y_u5 = 99.81 Volts < -1.144 deg. y_i6 = 2.099 Amperes < 2.963 deg. y_u7 = 199.4 Volts < -1.148 deg. y_u8 = 0.01652 Volts < 178.9 deg. y_u1 = 0.00117 Volts < 65.23 deg. y_u2 = 22.78 Volts < 52.47 deg. y_i3 = 0.117 Amperes < 65.23 deg. y_u5 = 11.4 Volts < 53.48 deg. y_i6 = 4.027 Amperes < 146.5 deg. y_u7 = 22.83 Volts < 52.47 deg. y_u8 = 0.0522 Volts < 52.47 deg. The names of the state variables are returned in the states matrix. Although this circuit contains a total of six inductors and capacitors, there are only four state variables. The names of the state variables are given by the first four lines of the states matrix. The last two lines are followed by an asterisk indicating that these two variables are a linear combination of the state variables. The dependencies can be viewed in the output file power_circ2ss.net. The A,B,C,D matrices contain the state-space model of the circuit without nonlinear elements (all switches open). The x0 vector contains the initial state values considering the switch Sw1 closed. The Asw, Bsw, Csw, and Dsw matrices contain the state-space model of the circuit considering the closed switch Sw1. The x0sw vector contains the initial current in the closed switch. The system source frequencies are returned in the freq vector. The corresponding steady-state complex outputs are returned in the (6-by-3) y matrix where each column corresponds to a different source frequency. For example, you can obtain the magnitude of the six voltage and current outputs at 60 Hz as follows. The initial values of the four state variables are returned in the x0 vector. You must use this vector in the State-Space block to start the simulation in steady state. The initial values of switch currents are returned in x0sw. To start the simulation in steady state, you must use these values as initial currents for the nonlinear model simulating the switches. The Simulink diagram of the circuit is available in the power_circ2ss_slk model. If no resistive switches had been used, the linear part of the circuit could have been simulated with the State-Space block of the Simulink/Continuous library. However, as resistive switches are used, the sfun_psbcontc S-function is used instead of the State-Space block. This S-function reevaluates the state-space matrices during simulation when the circuit topology is changing (after a switch is opened or closed). Appropriate inputs and outputs are used to connect the switch and saturable reactance models to the linear system. Notice that the status of each switch is fed back from the breaker to the S-function, after the inputs mentioned earlier. You can find the Breaker and Saturable Transformer blocks in the Fundamental Blocks/Elements library containing all the nonlinear continuous models used by Simscape Electrical Specialized Power Systems software. As the breaker model is vectorized, a single block is used to simulate the two switches Sw1 and Sw2. 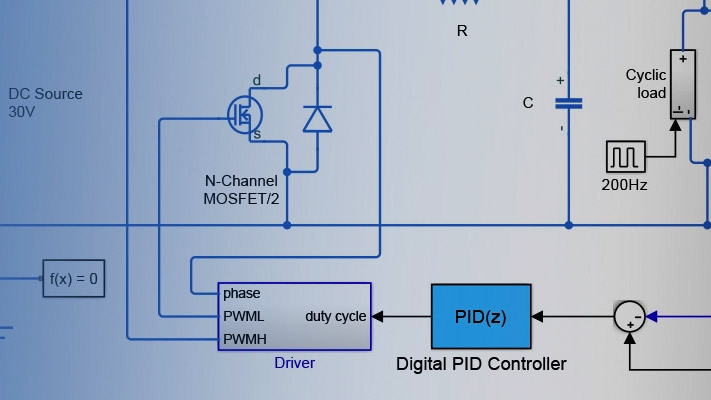 If you use the Simscape Electrical Specialized Power Systems library to build your circuit, the same Simulink system is generated automatically by the power_analyze command. The Simscape Electrical Specialized Power Systems version of this system is also available in the power_circ2ss_sps model.